Please call or email us to place your order for Aulos Recorders. Delivery time may vary due to availability. 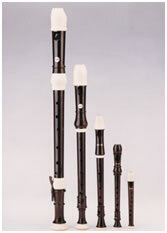 You can not buy all Aulos Recorders on line at this time via our web site as we do not always have all models in stock. L to R: Aulos Bass, Tenor, Alto, Soprano, Sopranino.